This year's Performathon was a great success! 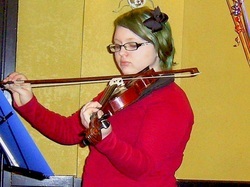 Claire Harper, student of Loreen Petty, placed first in this year's Performathon fundraising competition. First prize: $75 gift card for I-tunes. Claire was thrilled and downloaded the whole lot in one day. Glad you liked the prize, Claire. 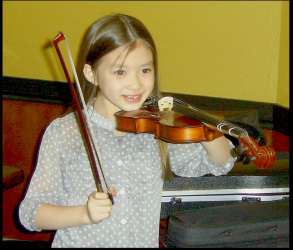 Emily Tran, student of Andrew Bushnell, loves to perform and we love watching her. Thank you, Emily, for your support. 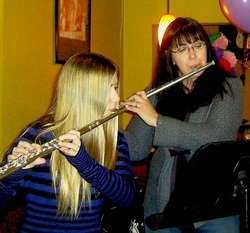 Annalisa Clough, flute student of Kristi Wiant, took second place in this year's Performathon. 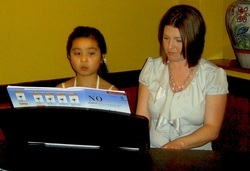 Thank you, Monica, for your excellent performance as well as doing a good job supporting our school. Ruben and his staff at Sabor a Mexico were warm and hospitable to all our families and their friends who attended the Performathon on March 10. Expressing our appreciation are, L to R: HIlda Casas, art instructor; Al Smith, double bass and guitar; Kristi Wiant, flute instructor and GNS Board President;Ruben, owner of Sabor a Mexico; Board of Directors member, Jean Holye, her husband, Rod, Board Secretary, and Eliza Klett and her daughter, Otilia. Eliza is Board Treasurer. We had a great time, the restuarant is colorful and friendly, the food excellent, and a great place to be on a rainy day. Thank you all for making our Performathon such a great success! our pretty prima donna piggy. You can find her hiding all around the school. We're counting every penny and Polly gladly accepts all loose change.